A few weeks back, I decided to try a popular Facebook game entitled FarmVille. I kept reading stories about the money Zynga was making off its popular lineup. Did I mention the number of FarmVille invitations and gifts I received? At first, FarmVille reminded me of another game, the Sims. Like the Sims, I am given a plot of land and told to build upon it. I was encouraged to invite my friends, of which many are already playing. The problem with FarmVille is that I found it to be extremely boring. I spent much of my day planting seeds and harvesting them. Sure, I could buy farm animals, buildings, and other decorations, but why am I doing this, again? It was right after I planted my last crop that I decided to check out a new game, FrontierVille. From the start, I like it. 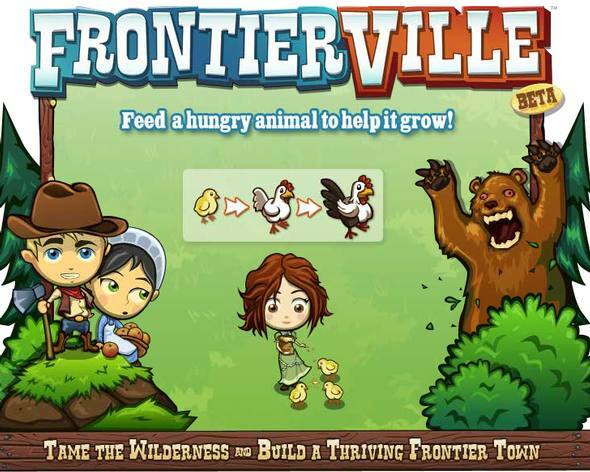 The greatest difference between the FarmVille and FrontierVille were the challenges, FrontierVille had them and FarmVille did not. The game challenged me to complete a number of objectives, such as planting wheat or raising chickens. The largest task to date was getting married, but now it's all about finishing the construction of a new school. Throughout the game, I spend time managing my farm, garden, buildings, and land. I fight off bears, foxes, snakes, weeds, trees, and cactus, all to grow my experience points and financial wealth. At level 15, I have watched how others manage their plot of land. Some do very little while others use nearly every inch of their land to house decorations, animals, and crops. Not sure how they tend it all, but they seem to do alright. As of now, my strategy is simple. I only plant or grow what I can afford to tend. This means no large gardens or zoos. Based on my calculations, each of us only earns 12 energy points per hour. Therefore, to manage my land, I have to use these 12 points responsibly. So far, I divide my energy between each of the major areas (animals, crops, fruits, trees, buildings, and weeds). If I cannot manage it, I sell it. When I'm not tending to my land, I use the remaining allotment of time to help my neighbors with odd jobs or giving gifts. In return, my neighbors help me, which allows me to invest my energy doing other things. Overall, FrontierVille is a fun game. However, if not put in check, it can easily steal a few hours from your day. For those playing FrontierVille, what is your strategy for managing the land? What tips would you offer a newbie to the game?